Every now and then I listen to someone tell me about a place they visited with amazing food and service. I enjoy learning about new eating opportunities especial when they are close to home. I have been intending on visiting a small “mall restaurant” in the Bay Roberts Mall but I have always gotten side tracked by the allure of my usual eating establishments in the local area. On Tuesday I heard about a group of retired teachers who get together regularly for lunch and to catch up with each others. This time they visited “Fraser’s Restaurant” and were very pleased with the food and especially the service. Of course this peaked my curiosity and as a result I visited there today to see for myself. The following is a critique of Fraser’s Restaurant. My first thoughts were, “how good can a little place with about 6 tables actually be?” The sliding doors to the entrance were typical but adorned with drapery that seems uncharacteristic with such an establishment. My pleasant surprise continued with the friendly greeting I received and the linen clad table that awaited me was a site to behold. Paper napkins, plastic table cloths and utensils were no where to be seen , only clean linens and cloth napkins showed detail and pride of ownership. The service was swift and friendly and holding true to their promise, I had water before menus. 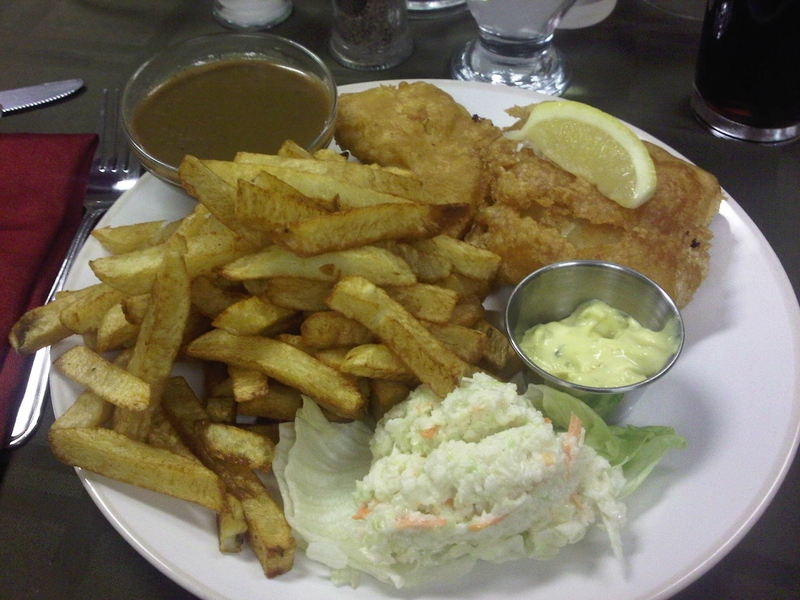 I ordered fish and chips for my virgin soiree visit; within minutes the meal was presented by the chef . It was evident that the fires were home cut, the batter was light and flaked, not bulky like some other places hide the texture of frozen cod, it was light and appealing to the taste buds. After tasting and asking a few questions to the chef I was pleased to hear that all his creations were made from scratch including the tartar sauce, gravy and coleslaw. I would describe it as crisp, fresh and worth the drive to the little mall on the Conception Bay Highway. One last observation was the placement of comment cards on the table, the selection of the questions can tell a great deal about the owner/s of a restaurant, he did want the diners input. The impression of the card after being impressed that there were actually cards there was that my experience was premeditated. Chef Dean Davis set a benchmark for himself and his staff to start taking care of the patron the minute they walked through the door. One of the questions asked “Were you greeted before you were seated” another asked “Did you receive a cold glass of water before menus were presented”. There little cards gives the customer the opportunity to comment but also to realize the owner understands taking care of the customer and do not mind displaying their standards to be critiqued. For a lunch time, small town eating establishment I would give Fraser’s a 4 out of 5 stars. My hopes are that it will remain a treasure but not hidden. Thank Lois for your heads up on this gem.